“It was 1932 and the height of the Depression…” my mother would begin, and she would tell the story of the little old-fashioned pump organ in the Oysterville Church. In those years following ‘the Crash of ‘29’ there weren’t many bright spots in Oysterville. And there certainly wasn’t any money. As my grandmother Helen Espy wrote to her son Willard: We are far from in need, but are not exactly enjoying ourselves… We are doing a lot of old time bartering these days and it works fine. We have traded oysters for apples, cabbages, rutabagas etc. and now have exchanged some old lumber for potatoes. Even so, at one of the monthly meetings of the Oysterville Women’s Club that year, Edith Olson suggested that they all save their “egg and cream money” (as spare change was called) toward the eventual purchase of an organ for the church. And they did! Like now, there was only one church in Oysterville. The Methodist Church at the north end of town (long abandoned by its congregation who had mostly moved to Ocean Park) had blown down in 1921. 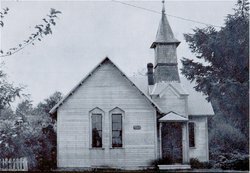 The Baptist Church served the needs of the community – funerals and an occasional wedding, usually with the services of a visiting preacher and not necessarily a Baptist one at that. The old building, like most structures in town, was in need of paint and there was talk of boarding up the steeple against the leaks. Even so, a few community members usually gathered there on Sunday mornings for a quiet (and perhaps not too joyful) worship service. Edith felt that what was needed – not only for the church but for the whole community – was music! Edith was a great believer in music. 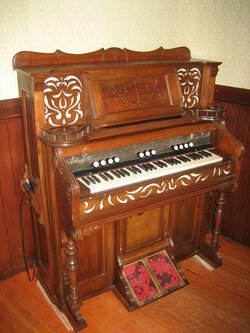 I never heard how long it took the women of Oysterville to save enough for the little reed parlor organ. Mom remembered that it cost about $25.00 and they sent for it by catalog order – probably from Sears, Roebuck and Company in Portland. Its old-fashioned sound has brightened many a church service in the last eighty years and its ornate oak cabinet is still a center piece at the Historic Oysterville Church. Edith would be delighted that the little organ is still being used. It accompanies the congregation as they sing the familiar, old-fashioned hymns during our summer vesper services. And, when I close my eyes and just listen, I can hear those women’s sweet voices as the church fills with the notes of “I Love to Tell the Story” or “Faith of Our Fathers.” That egg and cream money was surely well spent! This article is reprinted with permission from Sydney Stevens’ blog, “Oysterville Daybook”. The summer vespers schedule will be published in the ORF calendar will be available in early June.